Because of the large variety of dog training collars, owners should be sufficiently informed to make the right choices. Here are some things you should consider when looking for the right collar for your dog. 1.1 Electronic Dog Collar - This type makes use of electronic signals to eliminate the undesirable behaviors of the dog. For example, it will deliver a shock every time the dog barks. 1.2 Buckle Collar – As the name suggests, this collar is fastened using a buckle. It is usually made of leather, nylon or cotton and could be rolled or flat. Like many collars, this is one adjustable. Round buckle collars have the main advantage of eliminating the possibility of hair breaking. 1.3 Choke Collar – This is the most commonly used metal ring collar for both traditional and modern dog training especially the jerk-and-praise method. In this method, the dog will be given a yank whenever he disobeys a command. 2. Size of the collar – If the collar is too small the dog may be choked, if it is too large the dog may easily slip off it. The size of the collar should be enough such that it could provide both the comfort and the security. 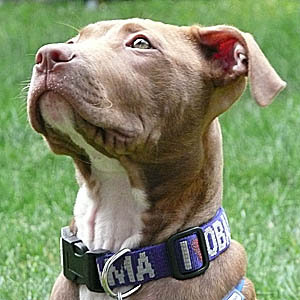 To get the right size, it is best to measure the dog's neck first and give some 2 to 3 inches allowance for adjustment. To check if it fits there should be two to three inches gap between the dog's neck and the collar. 3. Dog's breed – There are a lot of generic collars for all breeds of dogs. But for fashion purposes only, there are some highly specialized and fashionable dog collars that are made especially to amplify the looks of a specific breed. For example, bulldogs look good on spiked collars while toy dogs look fashionable with lace and stone studded collars. But if the collar is for functionality alone, the uses and the strength of the collar should be prioritized. 4.1 Color of the fur – For some people, wearing a collar must be a bit of being trendy. If you want the best of both worlds- collar for training and for fashion, you should learn to match the color of the fur with the color and the material of the collar. Just like in matching your attire, the color should mix well that it is pleasing to the eyes as much as it looks good to the dog. 4.2 Type of fur – Your choice of collar should also depend on the type of your dog's fur. It is recommended to get a flat collar for dogs with short fur to reduce marking and round collar for dogs with long fur as this would prevent the fur to flat out and break. 4. Budget – As a general rule, it is always best to look at the item first before checking its price as this practice normally gives someone better judgment on what looks good for the dog. However, you don’t have to spend a fortune to give your dog a good collar. For training collars, functions come first before anything else and sometimes you have to invest some good money for function alone. If you are on a tight budget, it is best for you to search around first before landing on your choice. Tossing a few dollars more could mark the difference between sacrificing the quality of the item and saving some pennies.